Why should we bring entrepreneurship education to schools? Richard Branson, businessman, investor, founder. Aged 16, his first business was a magazine called Student. Over the years, he has opened a chain of stores, Virgin Megastores, an airline, Virgin Atlantic, and a music label, Virgin Records. At age 64, 400 companies later, Branson is named the 7th richest citizen of the UK, and is more vocal than ever in his passion for children to be taught about enterprise and business. If such a well-established, experienced and successful businessman is openly calling for change in the way children are educated in state schools, shouldn’t we be listening? Speaking to reporters in a school in Lincoln, Branson said “I think the best way of learning to run a business is actually to run a business.” And after the Skills for the Futureprocess, I could not agree more. In schools, there is little talk of mortgages, loans or investments. There is usually little opportunity for young people to gain an insight into business, and the word ‘entrepreneur’ is usually paired with the faces of people like Branson or Lord Sugar in the media, not as something that everyone can be. Schools are brilliant at teaching skills to use in exams, but the focus is taken away from soft skills that advantage young people in the real world, when school finishes. Or at least, that has been the case in the past. With programmes running alongside schools and colleges nationwide, Skills for the Future being a leading example, young people are gaining a great knowledge of business. Entrepreneurship shines out of young people, after being secluded inside the mind for so long. Although many argue this can’t be taught, and is engrained into individuals, its programmes like this that draw it out, and allow for entrepreneurship education to become successful and worthwhile. Entrepreneurship education shows young people that mistakes can be made and learnt from.This contrasts the current education system, whereby answers are branded ‘wrong’ when they mismatch what has been taught, and students are taught that exam results will independently define your success in life. UK economy, and that 97% of UK employers highlight the importance of soft skills to commercial success. There are an increasing number of unsuccessful candidates who are being turned down not because of their qualifications, as a number are usually top grade high flyers, but because of their lack of soft skills. Entrepreneurship education not only closes this skills gap on applications, but also lessons the blow of rejection, as enterprise programmes emphasise the idea of learning from mistakes and knockbacks. When I was applying for university, I initially struggled to write my personal statement, because the current education system is so focused on academic success, and there is a lack of soft skill focused teaching. It was hard for me to convince a university to offer me a competitive place based on my previous exam results alone. I was not the only one, and studies have shown that in industry today, there is a significant skills gap in CVs and job applications. In fact, by 2020, it is estimated that more than half a million workers will be held back by a lack of relevant business and life skills. Becoming involved with the Skills for the Future programme has turned this problem around for me, and many others across the continent. Skills for the Future teaches important employability skills such as teamwork, time management and dedication. I teamed up with a group of people who I have never worked with before, and after many months of deadlines and discussions, we have come out of the other side with an impressive array of awards and experiences to impress potential employers. Now, it seems, I have almost too much business, enterprise and entrepreneurship experience to talk about. 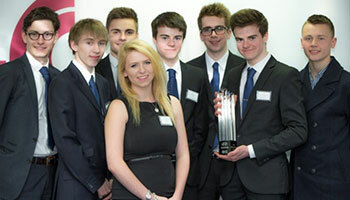 SoberDrive, the UK Best Business winner in the Skills For the Future process, started off as an idea on a piece of paper, and is now a full running business, about to compete for the European award in Prague, a considerable 722 miles away from the company’s beginning. With the help of entrepreneurship programmes in schools, like Skills for the Future, many other young people could be experiencing the same life changing opportunities as me, and here’s to the next 722 miles. Lauren Palmer is an SFF student from the United Kingdom, and a member of the 2015 'Hyundai Skills for the Future European Award' winning team, Soberdrive.